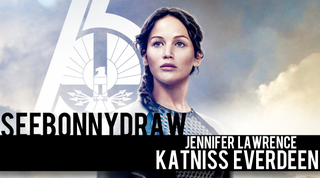 Katniss Everdeen in Speed Painting Form! TAYkin!!! Are you ready to fight for your lives for the enjoyment of others? JK, that's Katniss' job! I decided to paint another heroine following Avatar Korra from last week in commemoration of the release of Lionsgate's Mockingjay Part 1, starring J-Law! Avatar Korra in Speed Painting Form! Jennifer Lawrence aka America's sweetheart is the subject of the painting and I hope I got the likeness down. I approached the piece with a focus on color which the actual movies lack to depict the level of grim and despair the Capitol taxes on the rest of Panem. Once again, commentary is back to give you the insider look as to how it all went down. Hope you guys enjoy the art and video! The wrinkles of the jacket were a triumph, as was the pin. Both were fun to do! And I'll leave it at that! You guys into the Hunger games movies/books? Let's talk in the comments below!